So today should be the kind of day I wish the shop was already back open with new albums from Morrissey, Honeyblood and Slow Club. Instead it only highlights the problems we would face. 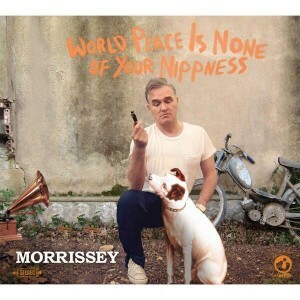 In the US the limited Morrissey 10″ EP was available from indies but in the UK things are different. Available exclusively for £6 from HMV and FOPP it also gives you a £3 discount off the new album and for anyone who didn’t have it the recent Morrissey book is £3 too. This price driven approach harks back to the bad old days and is simply unnecessary. With customers polarised these days between fans and those who will be content to listen on Spotify the result is clear. As with virtually all bands these days should you watch their latest video on YouTube Slow Club will direct you to iTunes, Amazon and their own site for exclusives. No mention of the indies that support them unless you check for their live appearances when they play the obligatory in-store at Rough Trade East and then later in the week at the new RT acquisition Rise in Bristol. You want a signed CD ? That will be an exclusive from their own site I’m afraid. Never mind long time supporter of Scottish bands Fat Cat have a highly touted album out by Honeyblood and there is a limited clear vinyl their Scottish fans many who have followed them from the start understandably are keen to obtain. Afraid not ! That would be a Rough Trade exclusive. Now shops tell me what to do is to play the albums in-store and pick up sales from customers who are unaware that they are missing out on a limited version. Many seem reconciled that they will be shafted week after week by artists and labels they have supported and fear saying anything will lose them what crumbs remain. As I have always tried to get over to people my position is not some stand against labels and bands and it is not about punishing bands by not stocking their album. It is about quite simply giving the customer the best service we can. Nothing highlighted this more than when the House of Love album came out on Cherry Red a while ago and there was an exclusive vinyl with an extra track not available to shops. I could not in all conscience sell the CD to customers I had known for decades in some cases when I knew that they would want the vinyl if they just knew it existed. Shop policy was to tell them that they could get the vinyl directly from the label which many did insisting to a man that they at least bought something else while they were in. Every shop faces different circumstances and for Avalanche with strong competition from HMV and FOPP for the more casual music fan we have always catered for the very knowledgeable fans of bands and music in general which of course in these days of direct sales is a major flaw in our sales strategy. I do get annoyed when I’m told to accept this is how things are because that is exactly what I do. However in the same way that it is hard to balance streaming’s popularity with decent payments to the artist so it is just as hard for a shop to justify a commitment to new bands, new music and new releases when they are put at such a disadvantage by direct sales. I do have a plan that may or may not work that will depend on that very strength that our customers are so knowledgeable and at the same time will embrace all the changes we face especially direct sales and streaming. Justifying a physical shop is even harder but as cunning plans go it might just work ! This happened to me re: The Honeyblood album. I didn’t even know there was a clear vinyl version!